Anne Griffin teaches both the core curriculum and advanced electives in political science. Her current work deals with the interfaces of public policy and collective memory and specifically with the memory of resistance in Belgium during World War II. She is the author of a documentary installation, Resistance and Memory in Belgium, 1940-1945: Multiple Narratives, which has been exhibited at several venues, including the Dutch Resistance Museum in Amsterdam in 2008, and most recently at the Queens College Art Center. Dr. Griffin is also completing a book on the same subject. Earlier work includes: Quebec: The Challenge of Independence, which examines the roots of the Independence movement in Quebec during the 1960s and '70s, and Forging a Women's Health Research Agenda: Policy Issues for the 1990s. She has also had experience in New York City politics, having served for five years on Community Planning Board Eight, and as Chair of its committee on revision of the City Charter for two. 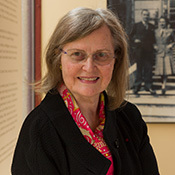 Dr. Griffin's work has been supported by the Fulbright Foundation, of which she has served on the National Screening Committee for Belgium, Luxembourg and The Netherlands; the Righteous Persons Foundation; the New York Council for the Humanities; and by several grants from the National Endowment for the Humanities. In 2011 she was awarded the rank of Officer, Order of the Crown (Belgium). She holds an A.B. from Wellesley College and M.A. and Ph.D. degrees from New York University, where she taught before coming to Cooper Union.